I'm going to start this review by saying I might be a little biased, but oh well. Dina Silver, the author of One Pink Line is my hero. She managed to publish two books and land a publishing contract all on her own. She didn't sell her soul to the devil (at least I don't think she did). Her efforts did not go unnoticed and her writing speaks for itself. Congratulations to Dina and a big thanks to her, too for answering all my ridiculous self publishing questions. I'm forever grateful. But, now...on to my review of One Pink Line. One Pink Line follows Sydney and her daughter Grace as they navigate the world of self discovery, acceptance and love. Told through both girls' point of view, Sydney's through flashbacks and Grace's during the present. Sydney, your typical college senior spends her days preparing for finals, seeking employment after her upcoming graduation and drinking with friends. After a few too many drinks, a roll in the sack with her friend Kevin, she finds herself unexpectedly pregnant only weeks before her graduation. After coming clean to Kevin and finding him uninterested in fatherhood and her in general, she turns to her family and friends, including her ex-boyfriend Ethan for support. Although, things seem to fall into place rather easily for this single mother, she still faces your typical struggles. Money woes, finding love and self doubt about being a young mother follow Sydney throughout the book. The book transitions to Grace's POV and how she discovers that her father isn't actually her father. Grace, being a self absorbed teenager, can't find anything good in her situation. Although she has two loving parents and a great home life. You follow Grace as she comes to understand her mother's choices and meets her birth father. One Pink Line is a touching story of self discovery, love and the struggles faced by mothers and daughters alike. Even though the storyline is predictable, it keeps you rooting for Sydney and hoping for the best. If you love a happy endings, which I do, this one doesn't disappoint. Dina's writing style is very conversational and flows nicely. There were times I laughed out loud and times I cried tears of joy for Sydney and Grace. The characters are real and relatable. As a self published author, Dina created a polished and in my opinion, near flawless novel. 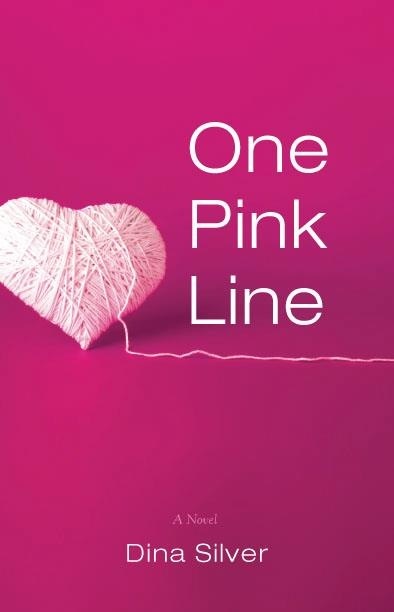 I urge you to check out One Pink Line by Dina Silver. It's your typical contemporary chick lit and I loved it! Keep an eye out for my review of Kat Fight also by Dina Silver! Carrabba's, where is the effing bread? Serious rage and The Googlemeister. Why I am glad I met my husband in college. What is the title and when does it come out? iPhone voice notes, I love you!